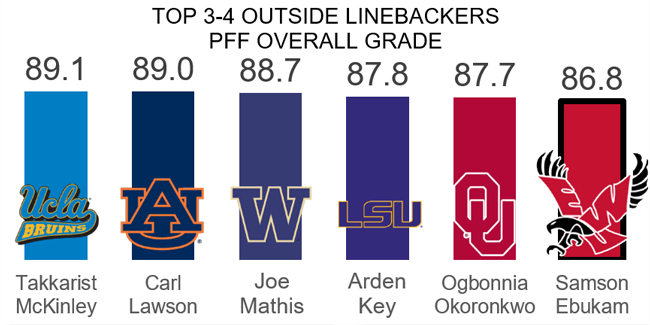 The Los Angeles Rams signed first-year outside linebacker Samson Ebukam to a four-year contract Tuesday, as well as the remainder of their 2017 draft class. It’s not hard to see what defensive coordinator Wade Phillips liked in Ebukam. His 86.8 overall grade in college in 2016 was the 19th-best mark out of 348 edge defenders to play at least 230 snaps. He was used most often as a pass-rusher at Eastern Washington, with 379 snaps rushing the passer, fifth-most among all 3-4 outside linebackers. His pass-rushing productivity rating on those snaps was 13.2, 16th-highest grade among 81 3-4 outside linebackers with at least 100 snaps as a pass-rusher. Ebukam is athletic enough to drop into coverage when needed, and to do so effectively. He allowed 6 total yards in 79 snaps in coverage, which is 0.08 yards per cover snap. This was the second-best mark among 3-4 outside linebackers with at least 71 snaps in coverage.